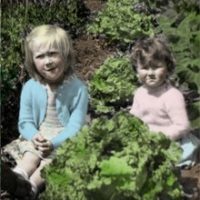 Unless the real person happens to have been a multi-millionaire, real gardens by real people doesn’t apply in this case, but I can’t resist. The person in question was Sir Henry Pellatt, the super-rich Edwardian industrialist whose dreams and moneybags built Toronto’s castle* Casa Loma. 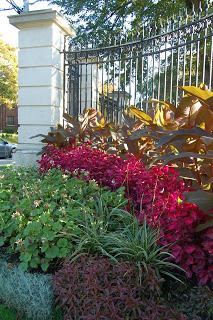 At least, this picture is of a garden… which gives me an excuse to talk about it all here. 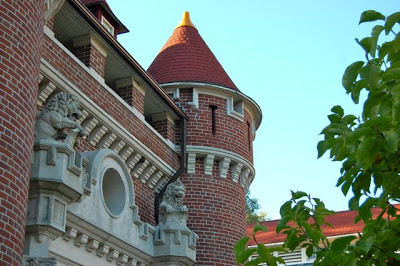 While Casa Loma has a nice big garden of its own, this little piece belongs to the building sitting almost kitty-corner to the mansion (and connected to it by a tunnel), Casa Loma Stables. I must have visited Casa Loma half a dozen times since kidhood, but had never looked around the corner at the stables till this weekend. Wow. No matter how fine the horseflesh was, these are pretty special digs. Like Casa Loma itself, and many of the city’s historic edifices, including Toronto’s Old City Hall, the stables were designed by architect E. J. Lennox. Lennox wasn’t without a sense of humour. He is said to have had caricatures of city councillors (who had refused to let him put his name on the building) carved in stone by the front door to Old City Hall; not to mention hiding his name in the stonework. It’s fun to pick it out, letter by letter. Ask me to show you some time. 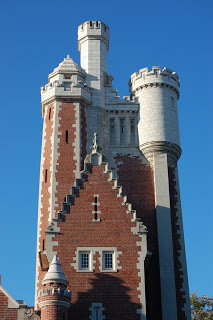 If you peer closely at the base of the top turret in the pictures below, you might see a squirrel lording it over the city at the top of the tower. It might look like a nut he’s chewing on, but I suspect it’s really a tulip bulb, the blighter. On the south side of the stables’ wrought iron enclosure is a green parkette with picnic tables and benches. It would be pleasant to sit here with something tasty while taking in the view of the stables and castle. 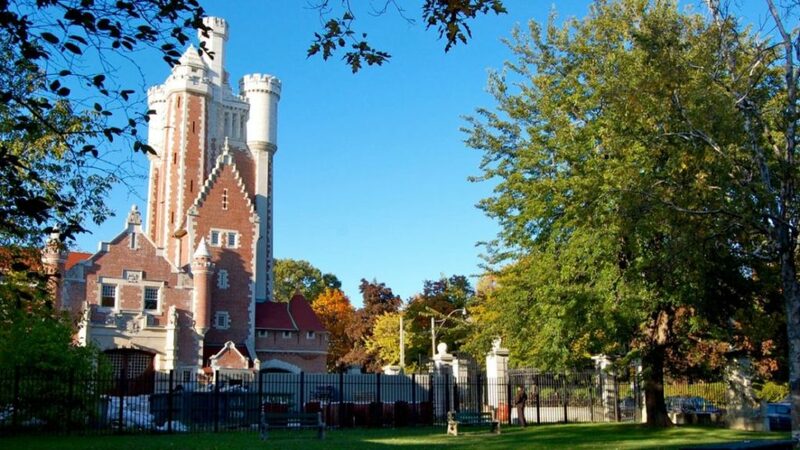 *It’s the architecture that gives Casa Loma its castle reputation. The name actually means “Hill House” inspired by its prominent perch atop an ancient escarpment. As an aside: In 1969-70, Sarah and I were fans of a laughable Canadian horror soap opera named Strange Paradise. Accompanied by the show’s wiggly 70s typography and a bongo-driven theme song was a spooky photograph of Casa Loma, standing in for the program’s setting Maljardin (Evil Garden, for those keeping score of the scant garden-related information in this post). Back to the stables. The long wing extending south from the lion-guarded stable door above is now the Potting Shed, a work area for the gardeners who tend Casa Loma’s gardens. 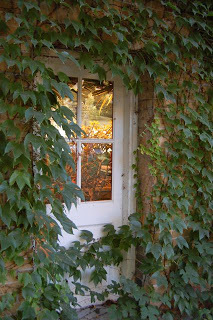 Peeping through the windows, we could see some of the tropicals now over-wintering there. 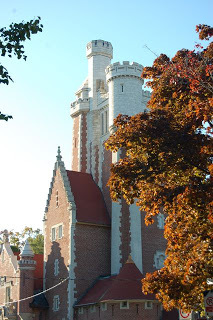 Casa Loma usually has a program of events around Hallowe’en. This year, I understand the stables are part of the ghost hunt for the first time… but it looks like the event is sold out. So if you wanted tickets, you don’t stand a ghost of a chance. 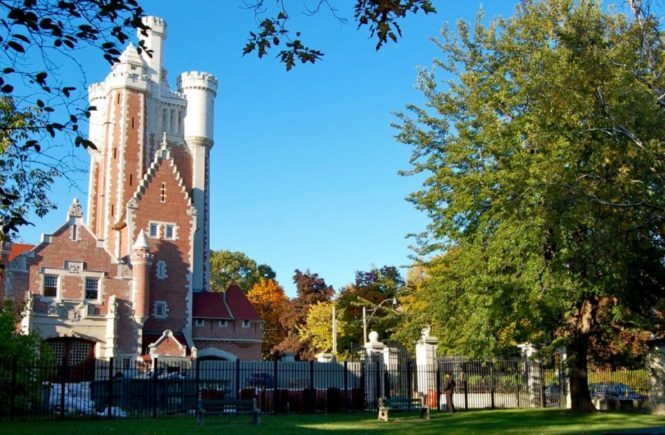 Have been to Casa Loma quite a few times over the years also. Even had our high school prom there back in 1972 (they won't do that anymore). Thanks for highlighting one of Toronto's treasures – at least it hasn't been "lost" to something modern. You were asking about where I'm planting my hardy cyclamens. They're in the front yard in light shade under the boulevard honey locust, but the front yard is raised about a metre by a retaining wall so there's not much root competition (don't know if honey locust roots are near the surface anyway), except maybe a bit from a nearby rose of Sharon. I don't know if you've read Larry Hodgson's Making the Most of Shade, but it's an inspiring book. He suggests that where root competition is a problem planting in submerged pots to give a little oasis free from root competition.